The unique Caboose Ultralight Graphite is considered the most light-weight, compact and useful dual baby stroller. Created for a couple of infants of various ages, it is preferred by parents for its practicality. With new upgraded features and an even lighter frame, the Caboose Ultralight Graphite continues to empower older children by giving them a choice to stand or sit while strolling. The Caboose Ultralight’s design has been improved with a brand new graphite-colored aluminum frame and it is 10% lighter than the previous Ultralight model. At 22 lbs. fully configured, it’s lighter than some single strollers. A new rear canopy attachment provides shade for the child sitting in the back. The innovative parent coordinator also holds two drinks and has a convenient zippered wallet for keys, mobile phone or wallet. A simple newborn car seat adapter is included and fits most car seats on the market. This useful accessory transforms the stroller into a travel system, allowing the older infant to stand on the rear stand-on platform. The storage basket is ample enough for a diaper bag. Sealed ball bearing wheels provide superb maneuverability and the 4-wheel suspension make for a smooth trip. The linked rear parking brake adds extra security when the infant stroller is parked. In addition, the Caboose Ultralight offers the most compact fold for a dual baby stroller. If your children are within 2 years of each other, you might consider the optional Caboose Rear Seat, which converts the rear bench seat into a front-facing, full-size, reclining seat. 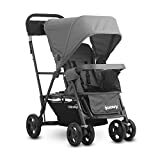 This accessory is sold separately and it folds up with the baby stroller for convenience. It is also easy to install or uninstall. The Caboose Ultralight Graphite is a flexible tandem infant stroller that offers the size, weight and maneuverability of a single stroller without compromising features.